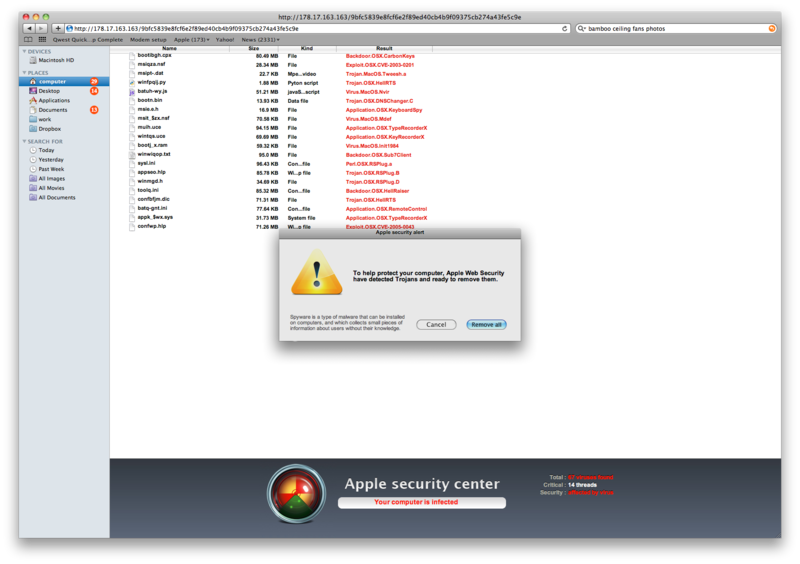 Macs get viruses. And the trojans are getting more deceptive. For years, virus makers have been tricking people into installing trojans under the disguise of a program intended to actually remove trojans that weren’t there. They usually did so by disguising themselves as part of Windows XP – which was an obvious fake for anyone using any other operating system. Look at that imitation of the OS X Finder. Not perfect, but it’s pretty dang good! I wouldn’t expect everyone to be able to tell that it’s fake. News of legitimate Mac trojans recently cropped up again, but it looks like they’ve gotten even more sophisticated with some pretty convincing fake Finder interfaces. People used to assume that Macs aren’t targeted for viruses for their lower market share, but it looks like that’s an even more unsafe assumption now. If you use a Mac, you aren’t exempt from being safe with your computer: don’t give it your Administrator password when you aren’t trying to install or update software. Any other time, it’s a trap! ← Chrome OS reflects the future of computing, but is it premature?